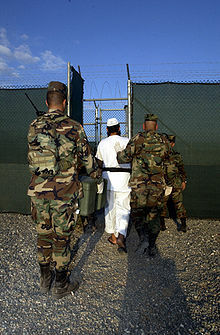 Previously on 12/03/2002 the Inter-American Commission on Human Rights had already granted precautionary measured in respect of 254 detainees requesting the USA to determine their legal status. The ignorance of the Obama Administration led the Commission to declare the violation of the right to trial and of the right not to be tortured on 21/07/2011. The Commission not only insists on either releasing or starting the trial of the detainees, but also declares that the diplomatic assurances must not be used to authorize the USA to violate the UN Convention against Torture. It denies the US argument on the applicability of the laws of war (right to detain combatants for an indefinite period), since contrary to the state of war it is unclear when and with whom a peace agreement could be concluded. Other requirements of the Commission include allowing it to meet and to interview the detainees, to provide education facilities for children and to separate them from adults.